Where real estate development meets preservation. Feb 24, 2019 DesignWeek Portland, 'ghost' streams, bike to D.C.? Nov 25, 2018 Rethinking adaptive reuse; former hosiery now apartments; what will Portland look like? Jul 28, 2018 Opening the Locks at the Willamette Falls? Maybe. Jul 17, 2018 Zidell Yards statement on next steps, wood skyscraper DOA, Portland Building...leggings? Jun 29, 2018 Indoor skatepark coming to Milwaukie? Beam Development and Urban Development + Partners (UD+P) continue to transform the Central Eastside with District Office, a six-story mass timber creative office building located at 525 SE MLK Blvd. With construction underway, the project features ground floor retail, open office floorplates, generous ceiling heights and innovative, double-height indoor/outdoor deck spaces. The mass timber project is underway just as another timber building was scrapped. Hacker Architects designed the project and will be moving its headquarters to the top floor of District Office upon completion in late 2019 with Andersen Construction building the project and JLL leading the leasing efforts. “As one of the first development companies to recognize the potential of the Central Eastside and help pioneer its transformation, we anticipate District Office will serve as a catalyst for the revitalization of the emerging Grand/Stark corridor,” said Beam Development Principal Jonathan Malsin. With 72,000 square feet of office space, District Office offers an extensive list of best in class amenities such as highly efficient mechanical systems, indoor / outdoor lounge space with operable windows and abundant natural light. The innovative design includes a 40’ column-to-window span to maximize floor plan flexibility and allows for efficient open or private office layouts. In addition, the building will be built with cross-laminated timber sourced in Oregon, which is a highly durable and resilient type of mass timber construction that achieves larger spans, beautiful exposed structure, lower environmental impact and benefits the rural Oregon economy. The new space will add 9,500 rentable square feet of ground-floor retail space, encompassing dining and retail, to the district to provide building tenants and the community with social and recreational features amongst the professional environment. District Office also offers onsite parking, showers and lockers, and bike parking for its users. “The Central Eastside continues to see an amazing progression of placemaking for some of Portland’s most dynamic businesses,” said JLL Managing Director Jake Lancaster. Zidell Yards statement on next steps, wood skyscraper DOA, Portland Building...leggings? After lengthy negotiations with the City of Portland, we’ve decided to mutually terminate the Development Agreement for Zidell Yards. It comes down to two simple things: the cost of public infrastructure and the need to secure outside funding. The public infrastructure that would have been a part of Zidell Yards included ten acres of new public parks and Greenway, new public docks and a publicly accessible beach as well as the extension of Bond Avenue and significant investments in affordable housing. We were happy to contribute as much as we could to these projects, but we compete for financing with projects across the city and nation. Zidell Yards could not bear the sizable additional infrastructure costs the City was requesting and still generate the market returns needed to secure outside funding. After nearly 10 years on Mississippi Avenue, Animal Traffic is relocating to the Central Eastside. Well known for their vintage clothes, Animal Traffic will occupy a 2.465 SF space with a 1,650 SF showroom in the newly renovated Taylor Works Building at 134 SE Taylor Street. Alongside their highly curated clothing selection will be a new shoe lounge. Animal Traffic will be an exclusive retailer of Dr. Marten’s Made in England line for men and women. 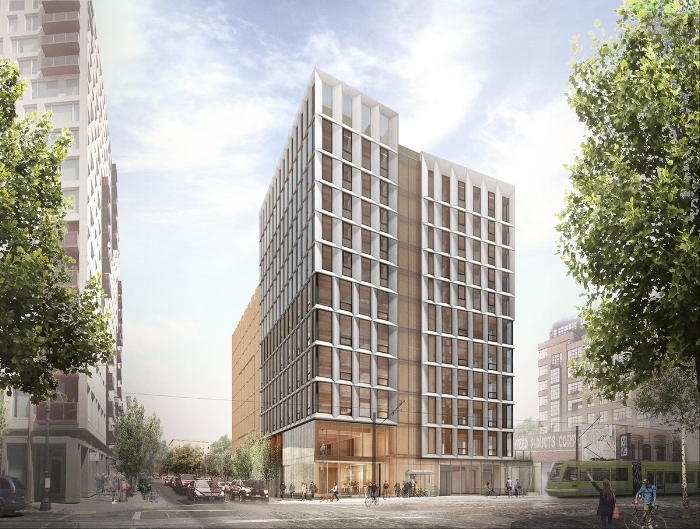 Willamette Week reported that the "deal to build a record-setting wooden Portland tower that was expected to be the tallest in North America is off." It was going to be 12 stories tall and constructed from cross-laminated timber. Reason: the costs were too high. It's exactly what you think it is. Portland Design Events, the "premier website for finding and sharing architecture and design-related events in Portland, Oregon," (and a favorite site of ours) also has a store where you can buy Portland design-inspired items. Like? Like these Portland Building leggings. The interior design is manipulative, but the exteriors are worse, for they actively encourage unhealthy behavior by abetting an auto-centric lifestyle and making the city actively worse for anyone who would prefer or requires other means of mobility, above all walking. Ok, it's not really a thing but it could be, drinking beers without driving, from downtown Milwaukie to Tilikum Crossing. Here's a quick take on your beery adventure. First (or last) stop: Beer Store Milwaukie. Revolving taps, OK food, bottles and cans. Next stop: Ruse Brewing, located in the Iron Fireman Collective building (after 7/14!). Update: Looks like The Portland Mercury thinks the same thing. Mt. Hood Brewery's new spot offers beers, pizza, a refurbished caboose as a dining room, and a front-row seat of the Orange Line and train museum across the street. Not to keep talking about beer, but... if you want to keep your beerventure going (or need to get to work) you can always keep walking down Water Avenue to a handful of breweries and taprooms. Or? Take the just-launched Water Avenue Courtesy Shuttle, for free. It runs from 6:30am to 9:30am and 4pm-7pm. with stops including the Dairy Building parking lot, Oregon Rail Heritage Center parking lot, North OMSI parking lot, ODOT Block parking lot, Eastside Exchange parking lot and Oregon Convention Center. Prowling around Central Eastside yesterday, we saw it cruise by pretty frequently. Mid-century church in Westmoreland a goner? 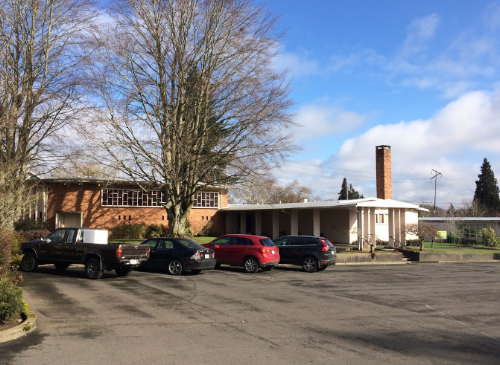 We always liked this mid-century church building but it might not be around for very much longer. Though the land is currently zoned R-1 and R-5, there’s a pending zone change of the entire site to R-1, a medium-density residential zone. Allowed uses include condominiums, apartments, duplexes, townhouses, and row homes. We’ll be watching what happens next. A quick note for NextDoor posters that post (which seems like every week) that they SPOTTED A COYOTE ON OUR STREET HOW DID IT GET HERE THIS IS A GOOD NEIGHBORHOOD: those coyotes aren't going anywhere (and were probably there first). In fact, they might be trotting around your backyard even more while you sleep. According to new research, human activity is forcing mammals to become more active during the night—because humans are disrupting them. Night noises just got more interesting. Snuggled at the foot of the Tilikum Bridge at a former TriMet transfer station (now called Bruun Dock Studios) we think the location will work for them. Even if they only got commuters hopping off the Orange Line for a quick pint and a pizza they'll rock it. Another win for Central Eastside. 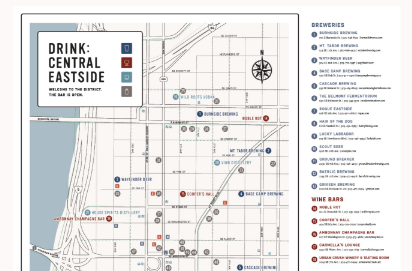 The folks at Conveyor have put together a micro-site of the history of the Central Eastside as well as a map of places to grab a drink. You can walk, hike, even bike it. (If you drive it, you won't find parking. And if you're drinking you shouldn't be driving. Wags finger.) If you're old school like me, look for hard copies of the map at selected establishments. Originally built as a warehouse in 1889, Overland Warehouse has served as temporary housing for immigrant families, a neighborhood market, and a nightclub over the years. In 2016, UD+P completed a full renovation that preserved and restored its historic structural elements while adding modern features that are needed for today’s creative office tenants. Unique among older brick buildings in downtown Portland, Overland features a stunning atrium built into the third floor that brings light down to the center of the building. As part of the renovation, the building underwent a complete seismic retrofit. And, just last month Restore Oregon presented the Overland Warehouse design and development team with a 2018 DeMuro Award. Indoor skatepark coming to Milwaukie? They'll be doing a pre-sale to help fund the building of the park, with the opportunity to buy sessions and memberships at a deep discount. Looks like they're opening at Wichita Town Center on King next to Urban Warrior. Stronger Skatepark says it will "provide a safe and clean space for people of all ages and abilities to engage in skateboarding and the local community." They'll also offer open skate times, camps, lessons, parties and other events. Cool. Check out their website for more info. The word skyscraper might be a stretch, regardless, this piece goes deep (or is that high?) on 12 Portland skyscrapers that changed the city for good (and bad). I don't normally recommend reading the comments from OregonLive but there's a lively discussion on buildings missed (of course there's the old-timer lamenting how much downtown has changed since—fill in blank of the decade when they peaked/moved here). Great pics throughout, too. I love it when the Oregonian dives into its pic morgue. And for the record, where's the Weatherly? White papers don't exactly instill a sense of excitement but this one is pretty fascinating. It's called The State of Urban Manufacturing Portland City Snapshot. Stay with me. In a nutshell, the white paper helps to try and understand what the small-batch manufacturing sector looks like, who its "entrepreneurs and employees are, and what cities can do to help these firms thrive and grow into larger jobs generators, and retain them within the urban core." One of the cities that the The Urban Manufacturing Alliance profiled is Portland. And one of the key takeaways I got (and, sure, I'm cherry-picking) is that manufacturing job growth between 2010 and 2016 was most evident in the Central Eastside district, where it increased by 30 percent. I'm intrigued by small-scale manufacturing and how individuals and companies are making stuff, not outside of cities, but right in the middle in places like the Central Eastside. 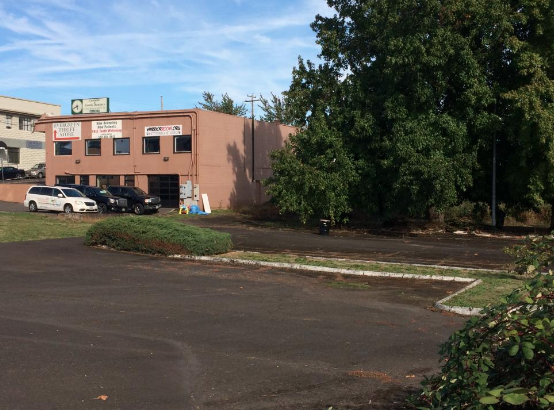 Affordable space represents the most urgent challenge facing manufacturers in Portland today, especially smaller, fast-growing companies that prefer to accommodate their expansions within city limits. And, they've got a new website to prove it. South Downtown wasn't even a thing like 5 years ago. And now? Here's some of what's going to be completed (whoa?) by 2019-2020. Axletree apartments, a new five-story, mixed-use development. Coho Point at Kellogg Creek, an opportunity site for a 5-story mixed-use building. That's just some of the projects. The future site of Coho Landing in South Downtown Milwaukie. The current building will be demolished. Source. Took a stroll down Division in today (as I do every couple of years) and was— as usual—blown away by the changes. I like that these kind of workhouse buildings (see pic) are still around. Two-story, retail on bottom, housing on top. Could this even get built anymore? Does code even allow that? Small-scale still exists along Division (surrounded by new construction). We've got to admit it was touch and go with the Guild. It was in disrepair for years, then vacant. (Buildings that are vacant for long periods of time always us nervous.) It was originally built in 1927 as the Taylor Street Theatre until 1948 when it was renamed, renovated in 1956, then closed in 2006. But wait! It was renovated in 2016. Original plans called for it to be used as a theater, but that came to pass. Until this year, it sat vacant. And now, Willamette Week reports that it will get a new resident—Japan's Kinokuniya Books. Chalk that up as a win. If you've never done the Beers Made by Walking hike, do it. Last weekend, we had the chance to wander around with Forest Park folks and brewers from Hopworks and Reverend Nat's Hard Cider. The two-hour walk provided a chance to see a new Metro trail under construction, a 500-year-old cedar, and a forest —mere miles from downtown Portland. Closer to town on Burnside in Forest Park it was recently announced the Burnside Wildwood Trail crossing has enough funds to be built. After support from myriad of sources, including Portland Parks & Recreation, Metro, major family and public foundations, private donations, and crowdsourcing, construction is predicted to start in late summer. Based on a stunning design inspired by the concept of a “bridge floating in the woods” by Ed Carpenter, an artist from Portland. Source. The engineering design for the new Kronberg Park Multi-Use Walkway is nearly complete in downtown Milwaukie. The walkway will stretch from SE McLoughlin Blvd. to the Kellogg Creek Bike-Pedestrian Bridge in south downtown Milwaukie. The bridge spans consist of two weathering steel beams with a concrete deck. Over time, the weathering steel produces a natural brown rust-colored appearance that blends well with the forested context, and also reduces the need for maintenance painting in the future. The bridge is supported on hammerhead-style concrete piers with round columns. The columns, in turn, are supported on concrete footings with driven pile foundations. The railings will be galvanized steel in a pattern similar to those used for the Kellogg Creek pedestrian bridge at the north end of the park. 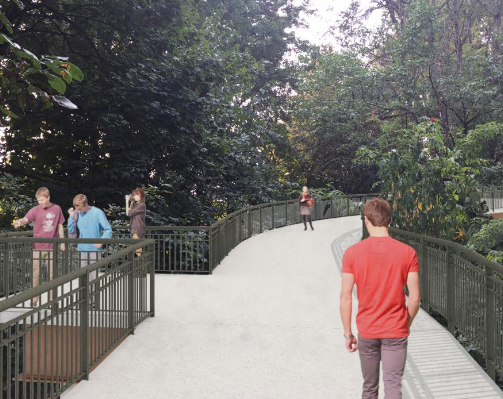 The walkway will connect downtown Milwaukie to McLoughlin. Source. Restore Oregon is inviting nominations for its 2018 DeMuro Award. Their goal is to recognize historic rehabilitation projects across Oregon that exemplify exceptional creativity, quality, and community impact, and to share the lessons learned. Submissions will be accepted through July 11th. They're an amazing organization and I love what they do. I seem to read about a new restaurant or bar opening almost every day. So there is clearly a demand for commercial space. Why not these newly built commercial spaces then, especially when most of them are in highly attractive, busy neighborhoods? The basic answer is, of course, that the rents are too expensive for small businesses. 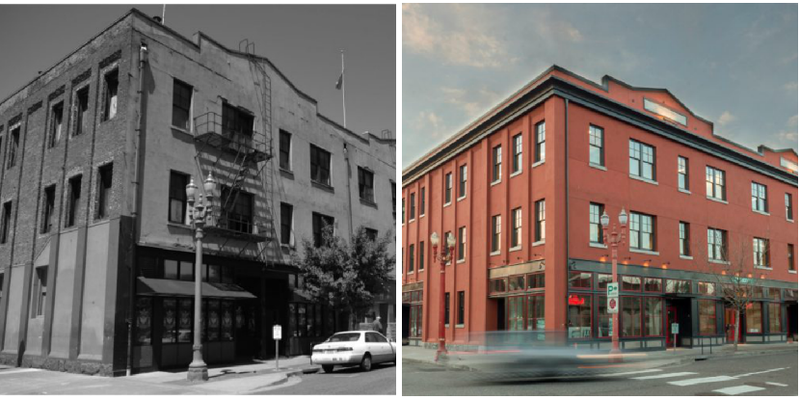 The Central Eastside and Eastside has such a rich fabric of older buildings that we hope can either a.) carry on or b.) at least be retrofitted and repurposed. Meet: the Luxury Bread Building built in 1929. Its previous life was a family bakery called the Luxury Bakery Company. Completely rebuilt from the ground up, the building will feature some impressive mechanicals, full seismic upgrades and will serve as a retail and production hub for the area, providing a home for Portland’s rapidly growing “maker” economy. Potential uses include food & beverage production, textiles, design, and creative office. Historical brick buildings, also known as unreinforced masonry buildings or URMs, "make up nine percent of the buildings in Portland. Though charming, they’re the most dangerous places to be in or near during an earthquake" (which can happen tomorrow or 100 years from now). So, what's Portland going to do? Tear them all down? Make owners pay a bajillion dollars to reinforce? Replace them with boring, vanilla condos? Glad I'm not the one making decisions around here. Interesting, leaky roof. Presuming this one's coming down when sold. Source. Downtown Milwaukie (or DTM—too soon?) is on the cusp of a huge building boom. There's new construction ready to start for the Axletree (110 units) and the rumor of a brewery on the bottom floor. Next door Coho Point at Kellogg Creek, a five-story mixed-use project is in the works. 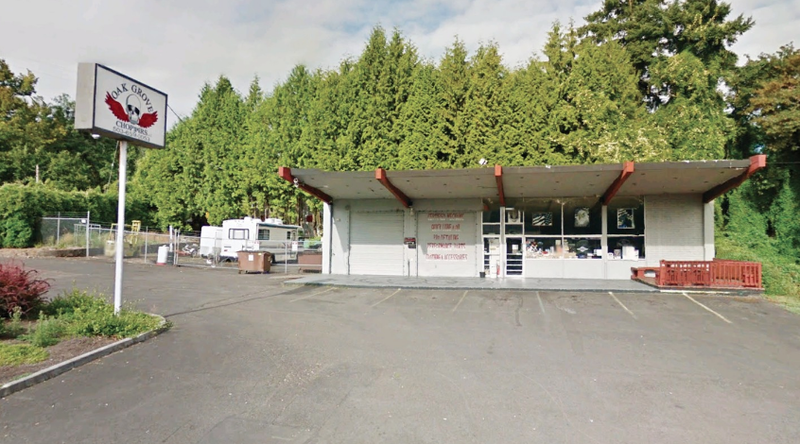 And if you cross McLoughlin, there's an interesting piece of property for sale in one of the few commercially zoned properties within the area. My guess is a tear-down. The roof leaks, it looks like it's going to collapse, it's a unique style. Watching this one for sure. The Axletree in downtown Milwaukie. Source. Portland is moving closer to changing mailing addresses for nearly 10,000 businesses and homes in what would be the most significant change to the city's address book since the Great Depression. For some of you in Southwest, you will now be in South Portland. Michael Andersen looks at Portland's infamous 1924 rezoning legacy that launched a "century of exclusion." For sale across from the Park Avenue Max stop—four parcels for a total of 27,014 SF lot. The site also includes a 4,752 SF industrial-flex building. The property is "ideal for owner use or a redevelopment opportunity." Source. Down in Oak Grove at the last Max stop, a key piece of property has been listed for sale. The whole corner is ripe for development. On one side you have the station, across from that is Max parking, then a 7-Eleven. With a local organization (Oak Grove is unincorporated) working with the county to re-imagine the intersection (e.g., introducing code so more sprawl doesn't get thrown up on McLoughlin) this might be a viable intersection someday. Lorentz Bruun Construction announced on its Instagram page that they're in the process of renovating an old furniture store on Grand (716 SE Grand). Built in 1904, the brick-cladded building had a modern facade plopped on in 1979. The building is next to Dig a Pony and Kachka. Bruun recently adapted the Iron Fireman warehouse building (1721-1799 SE Schiller St.) in SE Portland (coming soon: Ruse Brewing) and are working on the new Central Eastside Mt. Hood Brewery location at OMSI. There's brick behind that 1970s facade. Source. Speaking of beer (when are we not), down in Oregon City, First City Ale House (great name) has applied to the OLCC for a taproom on Main Street. Oregon City is booming.